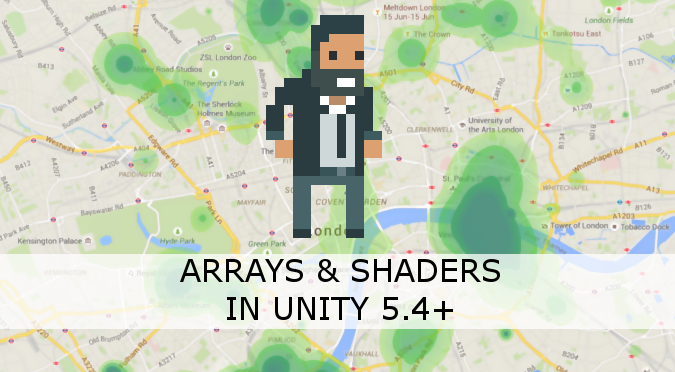 This post shows how to use arrays and shaders in Unity 5.4. Back in January I already covered this topic in an article called Arrays & shaders: Heatmaps in Unity. My original approach exposed an undocumented feature that allowed to pass arrays to shaders. Since then, Unity 5.4 has introduced proper support in its API. This tutorial replaces the previous article. If you have read the previous tutorial, you do not need any changes to your shader code and you can skip to Step 2. Every shader has a section called Property, which allows to expose certain variables in the material inspector. At the time this article is written, Unity does not support an array type. Consequently, you cannot access arrays directly from the inspector. It’s worth notice that Unity supports a type called 2DArray, but that is reserved for texture arrays; what we want is an array of numbers instead. All arrays, have to be declared as variables and initialised externally via a script. Arrays in shaders need to have a predefined length. If you don’t know in advance how many items you’ll need to store, allocate more space and keep a variable (for instance, _ArrayLength) that will indicates how many items are actually present. In the example above, both variables has been decorated with the uniform keyword. This is because their value is changed from an external script, and we assume that those changes do not happen in between frames. Unity 5.4 also supports global arrays. Those are properties that are set once and are then shared by all shaders. They work in a similar way, and have signatures SetGlobalFloatArray, SetGlobalMatrixArray and SetGlobalVectorArray. However, they are static methods of the Shader class. If you need to pass other types of arrays (such as int, long, Vector3, …) you have to use the method that closely matches your needs. For instance, you can fit int values in an array of floats. Similarly, if you want to provide Vector3s to your shader, you’ll need to wrap them into Vector4s. You can automatically assign a Vector3 to a Vector4, as Unity will automatically fit them in the right way, leaving the last coordinate set to zero. However, you cannot assign a Vector3 to a Vector4. I’m working with somewhat large dataset. At first I’ve noticed there’s an array size limit on cg (it’s mentioned on nvidia web site, but I didn’t see the exact size limit) – could you elaborate on this subject? I’m able to have an array size of 2000 without compilation errors. But it seems I’m unable to read values of this array at places greater than 1023. Any help on this subject would be appreciated. Thanks for the great tutorials. Yes, the size of arrays in shaders is definitely limited. I don’t think this is something you can change from Unity, unfortunately. However, you could split your render mesh in multiple quads, each one with a different material. You can check which points ends up in which quad, and assign only them. As long as no quad has more than 1023 points in it, it should work! Couldn’t they also just define multiple arrays? Or does that limit apply to all arrays combined in the shader? I have not tried that myself. But sounds like a limitation that could be very GPU dependent. Hello, I’ve known there are new features to support arrays and try to use it. But the demo can’t render anything. Is the old one deprecated? The old demo I poster won’t work anymore, unfortunately. I was wondering how do the variables look in the shader itself? Are you just declaring them in the subshader or are you using the “property” section? I didn’t think you’d have to since you don’t with regular floats. Also, in regards to your final point about fixed array size, isn’t that just the way shaders work? I thought you could never dynamically allocate memory in a shader, only reinstantiate. Which is why you can’t use lists in an array. But I’m a total noob so I could be recalling that incorrectly. The shader works perfectly in the Editor; however, instead of a circular heatmap data visualization I see triangles on my Android device (Galaxy S6). I’ve tried changing the Graphics and Quality settings in Unity and enabled 32 bit display buffer in Build Settings, but the shader is still rendering triangles instead of circles. Any guidance you could give would be greatly appreciated. Thanks again! This is really bizarre! I have not experienced this error. If you change your shader, can you get the entire quad to display correctly? Or it still only draws triangles? Hmm, I’m not sure if I understand your question, so sorry if my reply doesn’t make sense. The entire quad displays correctly in the Unity Editor but nothing I’ve attempted fixes the triangle issue on my Android device. But no luck… I wonder if changing either of these lines would work? I know nothing about coding Shaders, so I’m not sure if there’s any edits that could be made to force it to render circles rather than triangles. This is something that is very hard to debug, especially since I can’t debug it on an Android device at the moment. I want to understand where the problem is. It could be a problem of how arrays and shaders work on Android. Or it could be a problem with the precision on Android. Is hard to tell! The best way to see what the problem is is to progressively strip the shader from all of its code to see what is the minimum bit that works. If you change the shader so that it draws a solid colour, does it work? If you re-enable the shader, piece by piece, you can identify at which point the shader breaks. forgot to mention your example work is working very much fine with me and I am using Unity 2017.2. I am working on Eye tracking project and trying to generate 3d heatmap from students eye tracking data. I created 2d heatmaps but got stuck to generate in 3d. Did you create heatmap using Fove HMD. Firstly, thanks for writing all these tutorials, super helpful and I’m learning loads thanks to you. Hi Alan, thank you very much for your work, I was able to use this shader in my application with Unity 2018. However, I have some issue which I can’t the reason why. My issue is that some points I pass to my shader don’t get visualize properly, there is no color in the positions where they should be. In the editor I have to press some buttons around to reset visualization, and in my application I have to force an update by moving around the map. Could it be because I’m using a large quantity of points (less than 500 anyway)? I have to clarify that I’m also updating these points very frequently. Can it cause some issues? Thanks again and awesome work! I’m really happy my work has somehow helped you! Without seeing your actual implementation is hard to tell; it could literally be one million different things. What I would suggest you is to take your script, and only use it with let’s say 10 points, not moving. And see if at least that works as expected. An annoying issue with Unity is that the first array you send, sets the number of points you’ll be able to use in the array. So if you start your game with 10 points, you won’t be able to use 20 later on. You can restart Unity to clear that. This was such an annoying but which I am not sure if it has been fixed yet. Hi there Alan, I was able to setup this shader just fine, now I only have one question, how can I avoid looping through all the points for each pixel? This is a serious bottleneck for me and I don’t know how to get around this. Is there a way to only send the area of points to the shader so that it only colors those? If you are going to use this solution, there isn’t really much of an alternative. Which is why using loops in shaders can be problematic!